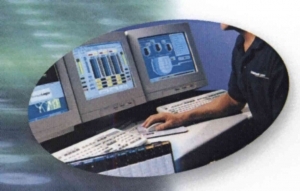 Logic Controls Ltd can provide all software programming to fulfil the requirements of the application. PLC programming. From our own requirements studies or a detailed customer specification. Operator Interface design and configuration. Screen layouts and controls for all applications to suit the various skill levels of operators within your factory. SCADA system design and configuration. Use our experience to ensure a common look and feel across your systems, to ease operator training and to allow easy future development. Motion Control systems design and software programming. Software based motion control systems with PLC interfaces can be provided for more demanding tasks. Custom software solutions can be provided when standard solutions don’t quite fit the desired application.